The thymus is a complex organ formed by different cell types that establish close interaction. The role played by the thymic stroma is very intriguing, since it is not only a connective tissue or a support structure. The stromal thymic epithelial cells (TECs), establish physical and functional interaction with developing thymocytes culminating in a unique function of this organ, the induction of central tolerance. The role played by the medullary thymic epithelial cells (mTECs) is noteworthy and is being the focus of many studies. The transcriptome of mTEC cells is also very complex. These cells express nearly the entire functional genome without altering their morphological and functional features. Among thousand mRNAs expressed, a particular set encodes together all peripheral tissue antigens (PTAs), which represent the different tissues and organs of the body. The consequence of ectopic proteins translated from these mRNAs in the thymus is immunological and is associated with self-non-self discrimination and induction of central tolerance. Due to the wide variety of PTAs, this process was termed promiscuous gene expression (PGE), whose control is shared between autoimmune regulator (human AIRE/murine Aire), a transcriptional modulator and forebrain-expressed zinc finger 2 (FEZF2/Fezf2), a transcription factor. 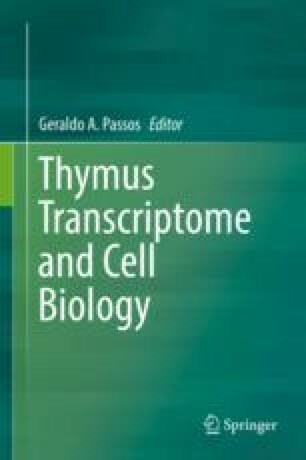 Therefore, this molecular-genetic process is closely linked to the elimination of autoreactive thymocytes in the thymus through negative selection. In this chapter, we review PGE in mTECs and its immunologic implication, the role of the Aire and Fezf2 genes, the role of Aire on the expression of miRNAs in mTECs, its consequence on PGE and the manipulation of the Aire expression either by siRNA or by genome editing using the Crispr-Cas9 system. We thank São Paulo Research Foundation (FAPESP), São Paulo, Brazil, through grant 13/17481-1 and 17/10780-4 to GAP, National Council for Scientific and Technological Development (CNPq), Brasília, Brazil, through grant 305787/2017-9 to GAP and grant 304931/2014-1 to EAD. This study was financed in part by the Coordenação de Aperfeiçoamento de Pessoal de Nível Superior (CAPES)—Brazil—Financial code 001. We also thank Ms Janine Bottosso Passos for the Figs. 9.2 and 9.3.